Creative continues to give Apple a run for its money in the PMP market, with the announcement of two new portable media players. Both players come under the X-Fi banner, meaning that they house Creative's award-winning Xtreme Fidelity X-Fi audio technology that is said to improve audio quality. The new technology claims to restore the audio quality that is lost when music is ripped to compressed formats. The X-Fi range comes in a variety of sizes (8GB, 16Gb, 32GB) depending on how much media you wish to add your player. Those who want WiFi accessibility will have to chose either the 16GB or the 32GB, as the 8GB comes without. All players include an FM radio and microphone and are equipped with a 2.5in TFT display screen. If you want to add extra memory, then there's also an SD card slot included. 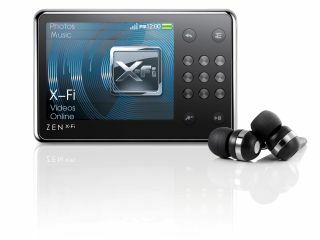 The Zen X-Fi 8GB, 16GB and 32GB will be available at the end of the month and are priced at £109.99, £139.99 and £199.99 respectively.